The pool was nice but the description of it online is misleading. There are only two waterslides. One of which is in disrepair. The hotel staff was friendly. The food was better than average. I had an issue with an alarm clock going off in another room for hours. They said they couldnt find it so from 5am until 7am I heard an annoying buzzer. Then our final night they had a huge metal rock concert on the lawn that kept the kids up. And of course at 5am the alarm clock from the other room started buzzing. Overall I expected a lot more from a high end hotel. Disappointed and we will not return. Such a fun resort for the kids! Helpful to have sunscreen and water stations available at the pool and beach. Brace yourself for the resort charges/prices but totally worth it. Beautiful hotel on the beach. Excellent location and service. Beautiful hotel and grounds but our ocean view was fairly far away from the ocean. Excellent staff and service. Great experience. The hotel accommodations were excellent. The grounds were well maintained and beautiful like being in a botanical garden. The staff were professional, extremely helpful and provided any needed information about the resort and the local area. The very best hotel experience I’ve ever had. I return for sure! Excellent vacation property! Beyond paradise. Grand wailea wins the award for best pool. Could use another restaurant and or more kid friendly facilities. My request would be for some family entertainment -not much to do after 5pm when everything at the hotel closes. Excellent experience throughout our stay. We were very impressed with the action plan to deal with the hurricane. Staff was outstanding. I can’t say enough great things about the Grand Wailea. Disappointed in the hidden charges they dont disclose until check in.. 30 a day vallet and 30 a day wifi room charge whether u want it or use it. Should not be an extra at check out.. vallet people were amazing. Not a fan of front desk people. If u were special they gave u the tour on the way to ur room giving you useful information on the hotel, whats included in ur stay etc. for us who books on Orbitz we were given a quick map that they drew the line to tell us were to go. Had to ask for help multi times to get the right hall and they seemed annoyed as they pointed a general direction and kept walking. Not worth the money to stay here!! The Grand Wailea is amazing! The pools are beautiful and it’s easy access to the beach. There are so many activities that you can do straight from the hotel. We plan on coming back! 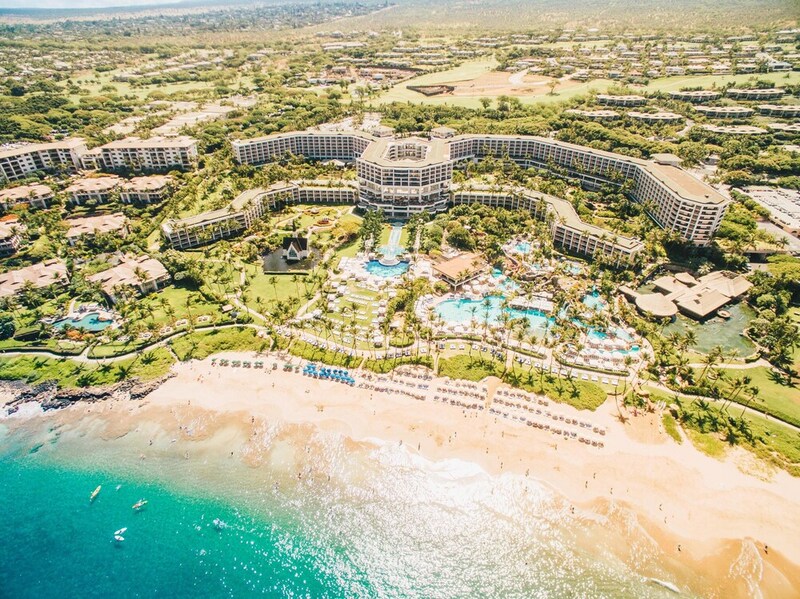 Located in Wailea within a short walk of Wailea Beach, Grand Wailea, A Waldorf Astoria Resort is within a mile (2 km) of other popular sights such as Keawakapu Beach. This 776-room, 4.5-star resort welcomes business and leisure travelers with 9 outdoor pools, a full-service spa, and 6 restaurants. Enjoy the ocean views at Bistro Molokini, one of 6 onsite restaurants. Savor a meal from the comfort of your room with 24-hour room service, or get a quick energy boost at the coffee shop/café. For your convenience, a buffet breakfast is served for a fee on weekdays from 7:00 AM to 10:30 AM and on weekends from 7:00 AM to 1:00 PM. Guests can expect to find 37-inch an LED TV with digital channels and a DVD player, along with free WiFi and wired Internet. Beds are dressed in premium bedding and the bathroom offers a soaking tub, a hair dryer, and designer toiletries. Other standard amenities include a furnished lanai, a refrigerator, and a coffee maker. Guests of Grand Wailea, A Waldorf Astoria Resort have access to a full-service spa, 9 outdoor pools, and a children's pool. Valet parking is offered for USD 30 per day. Multilingual staff at the 24-hour front desk can assist with concierge services, dry cleaning/laundry, and securing valuables. Other amenities at this beach resort include a fitness center, a spa tub, and a sauna. Buffet breakfast is served on weekdays from 7:00 AM to 10:30 AM and on weekends from 7:00 AM to 1:00 PM for a fee. Bistro Molokini - Ocean-view restaurant serving lunch and dinner. Alfresco dining available (weather permitting). Grand Dining Room - Ocean-view buffet restaurant serving breakfast. Humuhumunukunukuapuaa - Ocean-view seafood restaurant serving dinner. Cafe Kula - Café and bar serving lunch. The resort has 9 outdoor swimming pools and a children's pool. A spa tub, a sauna, and a fitness center are other recreation options. Reservations need to be made in advance for golf tee times. Contact the resort at the phone number listed on your booking confirmation. Newly Remodeled Gorgeous Island Style Bungalow - Steps to Sand, Surf, Shops!